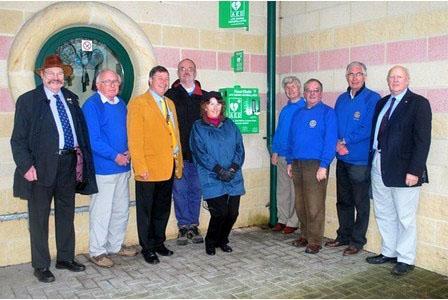 Members of the Rotary Club of Crewkerne officially unveiled a defibrillator at the sports centre at Wadham School on Monday. The first of a raft of potentially life-saving defibrillators to be installed across Crewkerne over the next few months was officially unveiled earlier this week. A total of £12,000 has been raised by the League of Friends of Crewkerne Hospital and the Rotary Club of Crewkerne to fund the devices. The first device has been fitted at the sports centre at Wadham School and a second unit will be attached to the wall of Crewkerne Fire Station in the near future. Funding for two more devices has been secured and Rotarians are currently in the process of finalising their locations.